Approximately 25% of a tree is lignin – a biopolymer that glues the cellulose fibres together to form strong and durable wood. During the chemical manufacture of paper pulp this lignin is dissolved in either the sulphate or sulphite process, since the cellulose is the desired component for making paper. Lignin is cheap and readily available. It is a biopolymer that consists of a large number of hydrocarbon chains woven together, which can be broken down in an industrial process to its energy-rich constituent parts, benzenediols. One of these, catechol makes up 7% of lignin. Researchers at the Organic Energy Materials group at LiU, led by Professor Xavier Crispin, have discovered that this type of molecule is an excellent fuel for use in fuel cells. 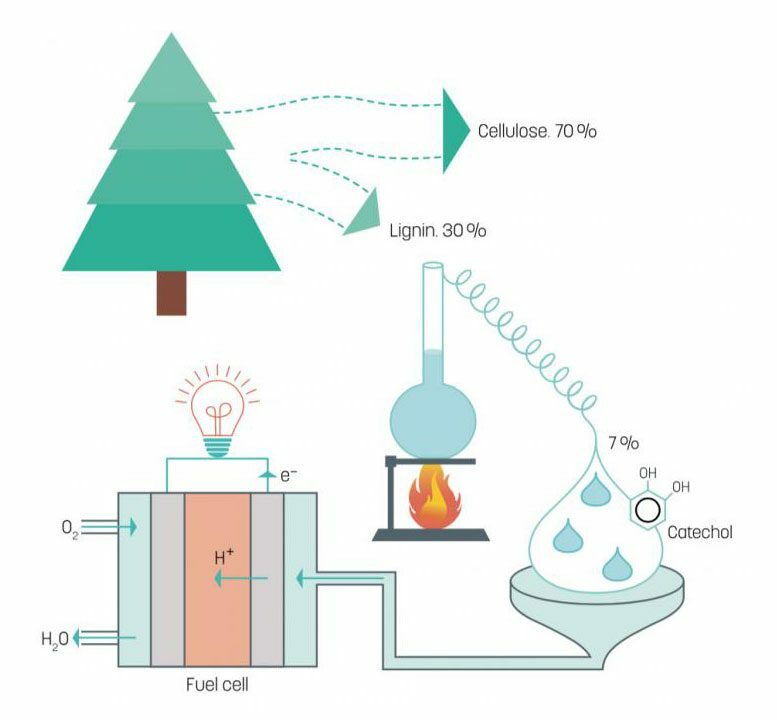 1 Comment on "Researchers Develop A Fuel Cell That Uses Lignin"
No mention of the waste product from this cell. Please explain what is left after the power has been extracted. No CO2 is obviously good – but what’s the plan for whatever is left over?